So the thing about eggs is that there are two kinds of eggs you can buy: Cage-free cruelty-free various-other-things-free free range happy chicken eggs, or cruelty-containing eggs. In the first case, you run the risk of having fertilized eggs (at least if you’re getting them from legitimately free-range chickens), because if the chickens are running around…well, sometimes they meet a rooster. This typically shows up as tiny blood spots on the yolk, and is only really a problem if you are trying to keep a Kosher kitchen, which my friends and I were doing during my undergraduate years. On the other hand, cruelty-containing eggs come from chickens that are confined to tiny cages and given no opportunities to meet with any other chickens of another gender, so all the eggs are unfertilized. BUT the addition of cruelty to the eggs makes them problematic for most vegetarian, especially those who are sympathetic to animal rights. It’s a conundrum, I tell you. 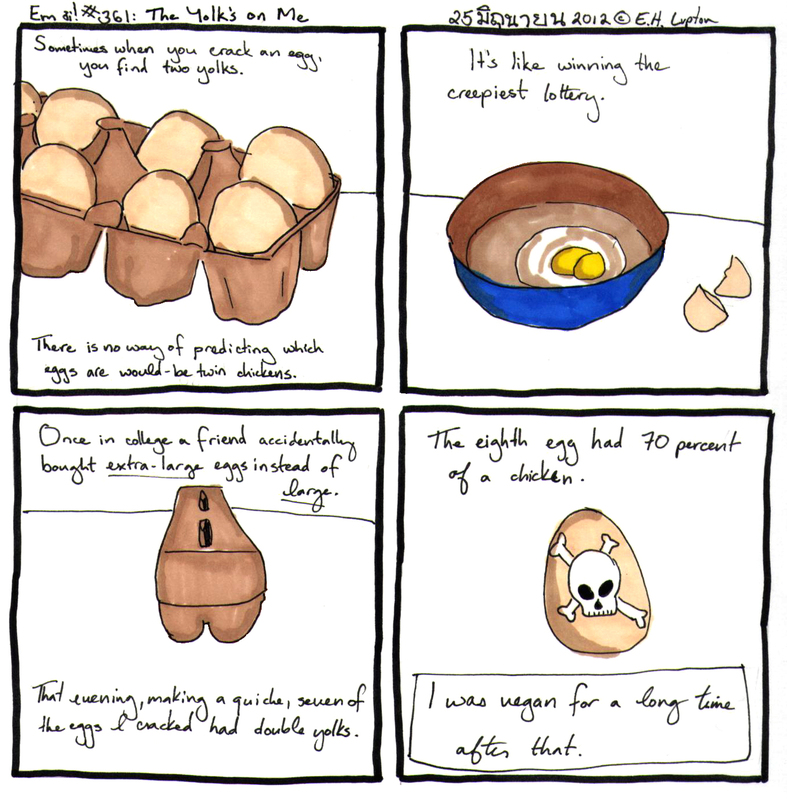 Anyway, this comic is why I don’t buy extra-large eggs (and why there was a long period of time wherein I didn’t eat eggs ever). I’m filing this comic under TX745 .L86 2012 for Home economics—Cooking—Food of animal origin—Eggs. Incidentally this is the second comic this month that I have filed under TX7nn, the other being TX767.C5 L86 2012.